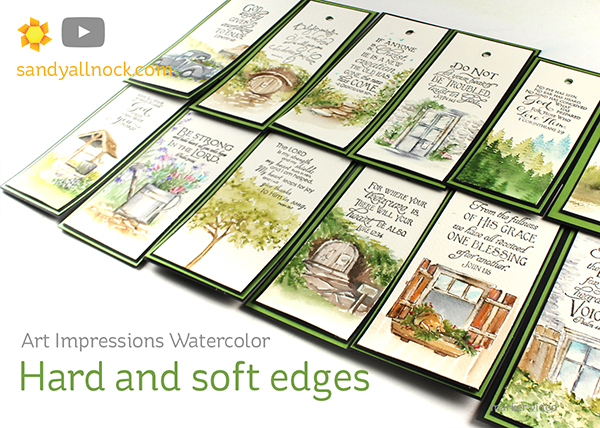 I’m taking a mini break in the “interactive” Art Impressions series to bring you “watercolor Art Impressions! Partly because I just couldn’t wait to share, but partly also because I wanted to let you know about the new Seeing the Scriptures class that finally launched today. Watch the video below or click HERE to see it in HD on YouTube. And the finished bookmarks! I’ll be selecting 12 winners who sign up for the Seeing the Scriptures class in the next week; I figured since they have Scriptures on them, I’d select just from students so I know they’re going to homes that’ll appreciate the text. Stay tuned on the Art-Classes blog for winners list at that time. Stamps are (I think?) all by Our Daily Bread Designs stamps; many are really really old so I didn’t go through each to check and see if they’re still available. The new class that launched today is one many have asked me about – how to think through a Scripture passage in order to come up with a unique image for it. In the first lesson I spend an hour blathering (lol) about my process; then I turn you loose in each lesson to use the method and come up with your own art. Then you’ll go to the next lesson and see how I thought through it, and I created THREE different pieces of Bible journaling to go with it – just to show you there’s no single “right” way to do anything. These were so beautiful and inspiring. What die set did you use to cut out the rectangles? As a librarian I can only adore these bookmarks. thank you for sharing the processes and your insights. I really do appreciate it. Thank you for sharing. Awesome bookmarks too! Awesome bookmarks. There are angels among us. This may be the single best, most creative, most brilliant, informative tutorial video I’ve seen in months. I take classes with Bonnie or Kendra when they come to town, and they’re lovely. But this – what – 15 minute video – took my breath away. I may watch it another 15 times. Thank you. Your art work is so beautiful Sandy. You are an inspiration to all of us. I have taken several of your classes and enjoyed all of them but the Seeing Scriptures is my favorite. I teach a bible journaling class at my church and will share some of your ideas with them as well as encourage them to join your class. Wow what a lovely bookmarks. Thanks for this great video tutorial with all the tips, I learned a lot watching it. 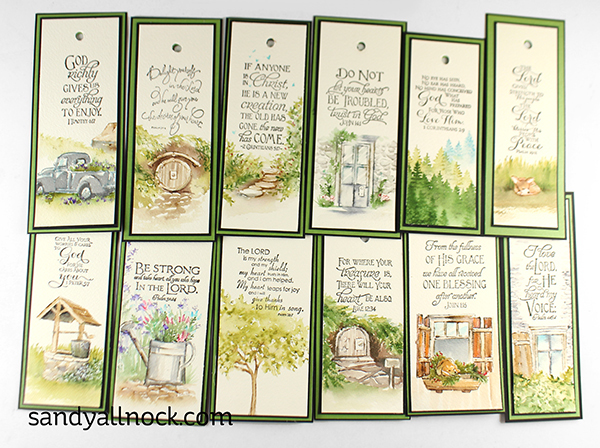 The Cobblestone set and the Wall Texture set are my favorites stamp sets, although every thing is stunning to use. Oh, Sandy…thank you for sharing your heart-felt testimony with us. Your willingness to be vulnerable is truly a sign of your faith. I immediately signed up for this class. I can use all the help I can get with digging deeper into the Bible. Can’t wait to get my info! Thank you, sweet lady! Sandy, thank you so much for sharing your testimony. It really, really touched my heart. I have struggled with the concept of bible journaling. I was taught the bible was a holy book and you don’t mess wit it. Your testimony just opened my eyes and heart to this new frontier (for me). Thank you for bringing this to life. For me you are the “angel with colored pencils”. Thank you so much for sharing this. 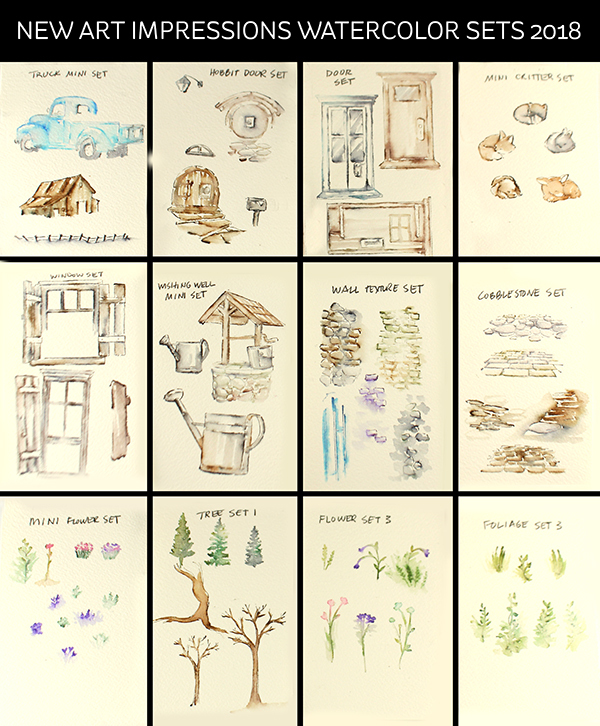 I am interested in learning Watercoloring. I start a class on the 12th. Such beautiful work. So inspired.